To further deepen the topic of CNVs formation: beyond evolution, we’ll now go into non-homologous recombination. preferentially located in microhomology sites (2-15 bp). Microhomology sites are too small for being involved in homologous recombination (HR). structurally diverse and complex: they can be microduplications or multiplications, microdeletions, microinversions or be interspersed. 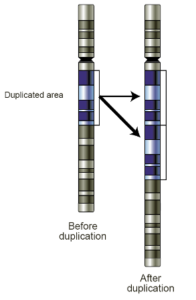 Replication slippage: during DNA synthesis a tract of the template strand within the DNA replication fork remains exposed to possible alternative pairings. So a newly synthesized fragment may pair on another tract of the strand that shows microhomology, leading to the formation of a secondary structure which will hide the relevant part of the template strand from the DNA copying mechanism. This will lead to the deletion of the tract hidden by the secondary structure. Similarly, the same mechanism may lead to duplication events. FosTeS (Fork Stalling and Template Switching): sometimes the above described secondary structures block the replication fork. So the newly synthesized fragments may pair on microhomology regions of another replication fork, generating deletions and/or duplications. MM-BIR: the template strand get broken during the replication process. Also in this case a piece of the broken strand may migrate on another replication fork and then get extended. Alternatively, the original broken strands may form another replication fork. However this results in a much less efficient replication fork, which promotes early disassociations and pairing of microhomology regions to form additional replication forks. Other important mechanisms of non-homologous recombination are Non-Homologous End Joining (NHEJ), which is of the non-replicative type, and breakage-fusion-bridge cycle, which is triggered by the loss of telomeric regions. Several CNVs are caused by transposons. Transposon are mobile elements which are able to relocate in different points along chromosomes. LINE1- or L1 – (Long Interspersed Nuclear Elements I) are the only transposons currently active in humans and they are crucial in the formation of CNVs, both in germline and somatic cells. Further readings: CNVs: NHAR (Non-Homologous Allelic Recombination). Posted in Academia, Last Update, Medical Genetics, Molecular Biology and tagged CNV, CNVs, non-homologous recombination.